One of the most unique features of HorseBiz is the pedigree function. Once you have selected a horse, click on PedigreeBiz. 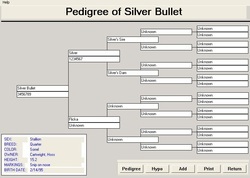 Here you create a pedigree for your horse. It will display 5 generations. To add the parents of a horse, click on the Unknown name. You will be asked to add a horse or select a horse. If the parent is new you can add the name and registration number. The system will automatically indicate to enter the name of the stallion or mare. If a Yellow field appears in the pedigree, it indicates that there has been a inline breeding or error. If you find the wrong horse was entered, just make the change and the yellow box will disappear. Do you want to find out the Hypothetical mating of two horses? Click on the HYPO button. Select the Stallion on the top and the mare on the bottom. The pedigree will automatically be generated. Hit the Print button and you will have a copy of any record. The Activities Folder is used for recording information about a horse which is not covered within the other folder topics. For example: trail rides, clinics, breed programs and more. Anything that you want to save can be added to Activities.